April 26, 2018: As we all know, sport can be joyful, inspiring, and so so sweet. On the other hand, sport can be unforgiving and heartbreaking. These ups and downs are what keep us going, and what makes us want to quit. It’s life, and as my dad says, it’s real. The past couple of weeks have been a bit of a blur and I’m just getting the chance to sit down and reflect. Our series premier was April 15 and I even had some fans from back home in the stands. After months of waiting, we were on our new field in our new kits and it was time to get to work. While we were a little shaky playing on a different surface (it was incredibly bouncy) we were able to secure a 5-0 win over Böljan. There aren’t too many great stories from that game, so we will just move on. Last weekend we played against Umeå, who will undoubtedly be one of the best teams in the league. I know our team is strong; we have all the pieces to have a really successful season, but an away match versus a powerhouse is a tough combination. We set the pace of the match in the first 15 seconds. Our game plan was to high press all over the field, not allowing their wingbacks and center mids to be able to serve a ball over the top of our back line to their hardworking and fast forwards. We came out hard and fast, and within the first few minutes I think it was clear it was going to be a battle for both teams. Sometimes in games like this, it is a little challenging to settle into a rhythm. Our team, usually quite possession based, had shifted into a little bit more direct style, and that really changes the tactics. It also leads to a bit more back and forth between offense and defense, which is exhausting. The good news though, was that it was the case for both teams. After a few good chances on both sides, Umeå had a corner kick. On a perfectly placed ball to our back post, one of their players came flying in and headed it into the back of the net. It was a great offensive play, and there wasn’t a ton of things we could have done differently. After you get scored on, you have two choices: you can recoil and start to shut down, or you can pick up the tempo and start to fight harder. We didn’t want Umeå to gain any more momentum than they had, so we battled back. And at the end of the first half, the score remained 1-0. In our team talk in the locker room, we agreed we needed to be better at winning the second ball. Moa, our captain, had done a great job winning the first ball on almost all goal kicks, but after she flicked it on, our players were almost never on the end of it. We also recognized that our direct style was exhausting us, and we needed to try and control the game a bit more. At the start of the second half, the game showed absolutely no signs of slowing down. Both teams came out aggressively and it was fun to be a part of it. Here is a fun fact: I passed the ball at the most four times the entire game. Every play I was a part of was defensive. I had to do so many headers that on Monday morning my entire back, neck and forehead were absolutely shot. But that tells you a bit about the game. There wasn’t a moment to rest, and we didn’t. A few minutes into the second half, we won the ball in our back third, and Moa made an incredible left footed pass over the top of their back line to Lana, my fellow American (woo!) and our #9 aka striker. Lana took a couple touches and easily placed it into the back of the net. We were back in the game and hungry for more. The game continued to be a back and forth battle. There were some very hard tackles, and I even got my first yellow card of my life. Can you believe that? 25 years of playing (mostly as a defender) and never a yellow! But, when their forward received the ball over our back line facing our goal at a full sprint with just me by her side, I had to kill the play, and so I went in for what I knew would be a foul close to the halfway line. Maybe it was overkill, but in those moments, working with so much adrenaline, sometimes you just go with your gut. The play was stopped and we were able to regroup, so for me, it was worth it. At 70 minutes or so, we got a corner. I am a target on corners, and I usually play on the back post or in that area. Somehow, the ball squeaked through and bounced right at my feet on the ground. “DON’T PANIC,” I thought. I’m much more comfortable heading the ball then placing it with my feet, and everyone knows what a center back shot looks like (cue kicking the ball 25 feet over the goal and wide). Alas, I relaxed, hit the ball and… no goal, but hey it was still in play! It was blocked by their defense, and it deflected back to our other center back (we call her Back, pronounced “Bach”) and she had a shot…. deflected again! Usually this is my cue to sprint back to avoid a counter attack but I stayed in the box thinking maybe just maybe something would happen. Once it was cleared out, I thought that we had missed our chance, but somehow, we got the ball again, and it was played out to our right side to Ingo. Ingo took a touch toward the endline and crossed it deep into the box. Our team recycled all our runs and as the ball was coming toward me all I could do was think “Just like a normal header. Just hit it like a normal header…. You do this 20 times a game. Just treat it like a defensive header and go for it. Don’t blow it you idiot.” And with that, I made my run, kept my eye on the ball, took a big breath and went for it. I closed my eyes for just a second as I felt the ball hit my forehead, and when I opened my eyes, the ball hit the back of the net, and all I could do was scream “F*** YES!! !” which is a bad habit I’ve started when big goals are scored. We were winning 2-1. The next 15 minutes were excruciatingly slow. Time seemed to almost stop completely. Both teams were hot, and it seemed like the momentum was shifting back and forth between us quite fluidly. We started to play a bit more defensive, and it felt like we were on our heels more than holding onto the ball. In the 89th minute, on what would typically be a routine save, our keeper Emelie came out to collect a ball close to the endline on the near post. Something snapped. Our other defenders heard a pop or a crack, and suddenly Emelie was on the ground, writhing in pain, and the ball which typically would be safely in her arms had gone right to one of their forwards. There was nothing we could do but watch their player put it in the back of the net with ease. But we weren’t looking at that. We were looking at Emelie, our anchor and protector in the back. 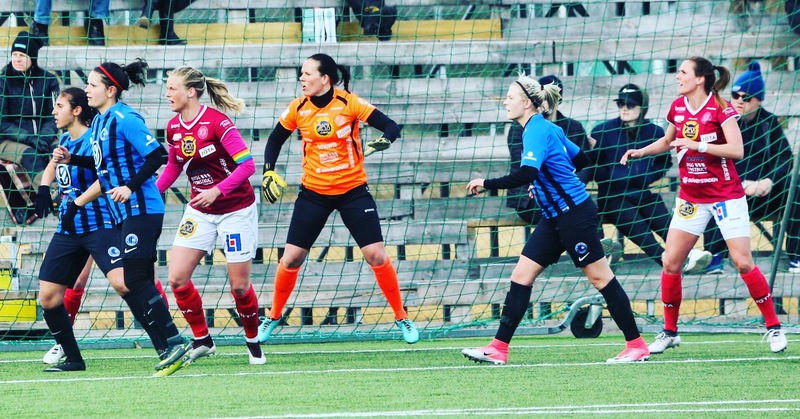 Emelie is strong, and she’s played at the highest level in Sweden. She is experienced and professional, and I just knew that if she was still on the ground that something was seriously wrong. Moa (captain) Emelie (keeper) and me defending a corner kick earlier in the season. Four minutes of stoppage time were added onto the game, and we had to put a field player in net, as our second keeper was also injured. It was, to say the absolute least, a bit chaotic, but damn it Julia had some confidence coming all the way out of the box, and she even made a save! Somehow, we managed to hold on those final moments, and the final score was 2-2. But we were all so gutted about our teammate, and as much as a win would have been sweet, at the end of the day you have to care about the people in your life more than the result. It was a bit of a somber trip home to Uppsala, but in a way, we all got stronger on Sunday. Sadly, we learned Emelie is going to be out for quite some time with a serious achilles injury, but I know she will come back better than ever when it is all said and done. It’s been a busy few weeks, and there are no signs of slowing down anytime soon. I hope to write something a bit happier next time, but the reality of sports and life, is that things happen. We just gotta keep chugging along. Until next time, peace, love and football.